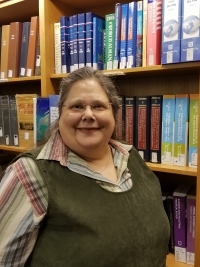 Jennifer C. Boettcher (bO•cher) is the Business and Economic Liaison and Reference Librarian . She can help with research in economics, social science data, marketing, management, international business, accounting, finance, public finance, knowledge management, copyright, and corporate intelligence. She was formerly Business Librarian at Texas A&M University and Head of Reference at the National Small Business Development Center Research Network. Her research focuses on government sources and industry research. She co-authored, with Leonard Gaines, Industry Research Using the Economic Census: How to Find It, How to Use It (Greenwood Press, 2004) and has written widely on the NAICS classification system.